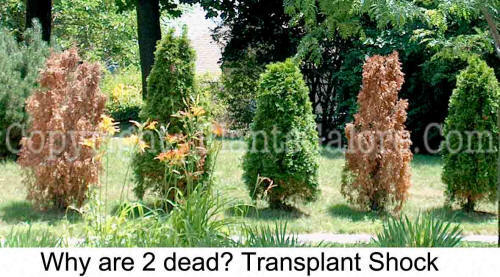 In about 99% of the cases when a transplanted tree or shrub dies within the first two seasons, the cause is transplant shock. It is extremely unusual for a disease or insect to cause the death of a healthy, young transplanted tree. The term "transplant shock" generally refers to the impact of the tree's inability to re-establish its root system. No matter how careful you are, whenever you move a plant, roots will be damaged and lost. For every plant, there is a balance between the number of roots needed to support a certain amount of leaves and stems. If a transplanted tree cannot re-establish this balance soon after being moved, it will begin to decline and may die. The key factor to transplant shock is water. For plants to grow new roots, they need an adequate supply of water and a good amount of oxygen in the soil. Too little water will result in wilting and death of plant tissue. Excessive water will eliminate the oxygen in the water and cause wilting and death of the plant tissue.